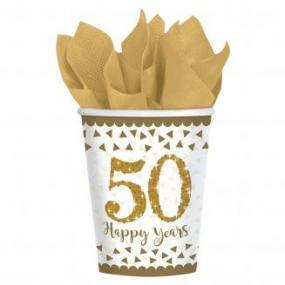 50th Golden Wedding Anniversary 50 Happy Years 9 oz (266ml) paper cups. Supplied in a pack of 8 - Perfect for a 50th Golden Wedding Anniversary celebration. Plates, napkins, bunting and tablecovers also available in the same range. Not for use with hot drinks.